Prospecting Secrets Webinar from Winmo on Vimeo. Presented by: Dave Currie | President of List Partners Inc. The advent of modern sales development has taken the marketing industry world by storm. Organizations everywhere are dumping revenue models based on old-school lead generation, cold calling and mass email blasting. Why? The power has shifted from the seller to the buyer. What’s truly challenging about New Business Development today? Delivering personalization, sincerity and professionalism at scale. That’s where Account-Based Sales Development (ABSD) comes into play. “A sales development approach in which prospective customer accounts are treated as markets of one, reached through hyper-personalized, targeted campaigns”. How (and why) to break-free of dated business development models. 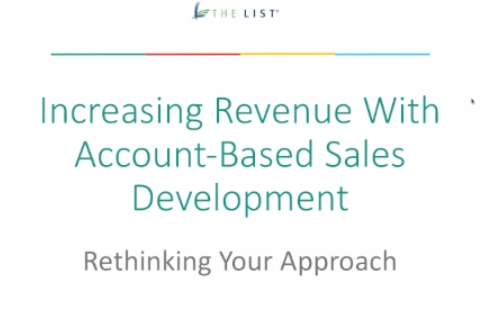 How to grow revenue through account-based sales development (ABSD). How to incorporate the principals of ABSD across your organization correctly the first time.